Arc welding is the most effective way of permanently joining metals. It melts the two metals being joined and fuses them together, effectively turning them into one solid unit. Arc welding uses electricity to melt the metals and the welding filler by creating an electrical arc. An electrical arc is like a tiny lightning bolt that passes between two metals, generating intense heat that melts the two metals and the filler material, fusing them together. 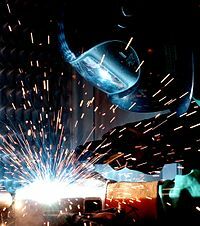 Commonly used for ship building in WWII, this method of welding has become common for creating steel structures. This page was last changed on 8 August 2018, at 17:01.